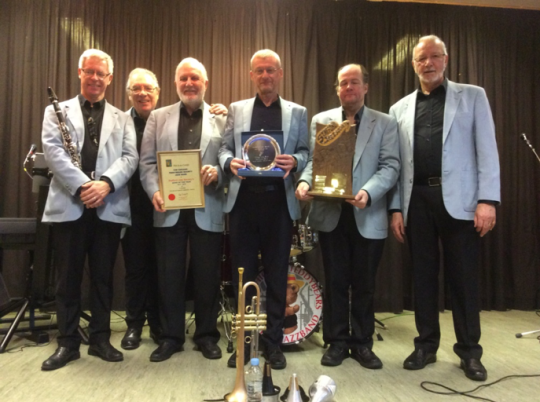 16 December – Chicago Teddybears Society Jazzband: We warmly welcomed back this band for our Christmas concert. We have Rae Owens on double bass and vocals (and jokes! ), Andrew MacKenzie on trombone, Jim Lucas on trumpet, John Padfield on reeds, Ed Lee on keyboard and Brian Singleton on drums. Some of their numbers were: “China Town My China Town”, “Dr Jazz”, “That’s My Fun Day”, “Canal Street Blues”, “Doo Wah”, “Magnolia’s Wedding Day” and ended up with a medley of Christmas numbers which had everyone singing along. 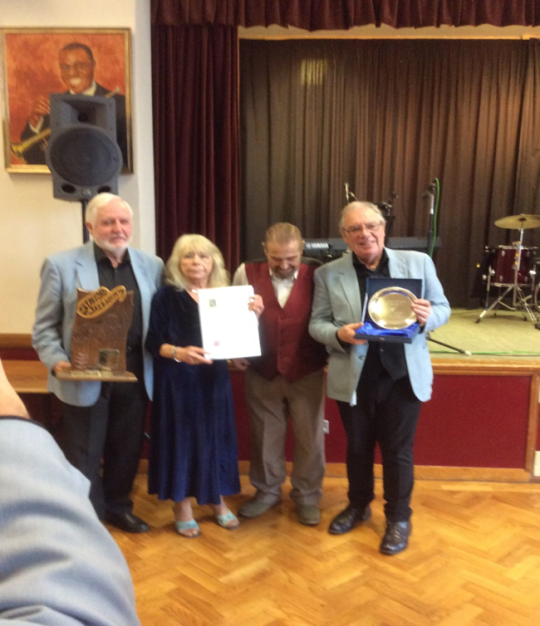 During the interval Ian and Jennie D’Arcy presented the band with SJS Band of the Year Trophy, an accolade they have now received for the third time. 9 December – Jake Leg Jug Band: This band represents the sounds of America in the 1920s and 1930s. 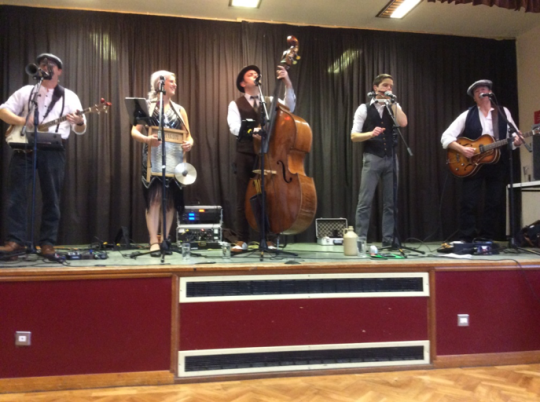 The leader is Duncan Wilcox on double bass, Bryony-Rose Ward on washboard and vocals, Neil Hulse on guitar, Toby Wilson on banjo and dobra and Liam Ward on harmonica and jug. Numbers from the afternoon included: “I can’t Dance because I’ve got Ants in my Pants”, “Little Black Train”, “Kitchen Man”, “My Feets too Big”, “Nuts for Sale”, “I Need a Little Sugar in my Bowl” and “On the Road Again”. Duncan explained for all those who may not have heard them before that Jake Leg was an ailment – a paralysis of the lower limbs due to consuming assorted home-made alcohol. During prohibition money was scarce and so musicians used various substitute instruments, such as a job for bass.